Just got her in five days ago and she is scared of my husband and other people. Will run out the doggie door when anyone goes in dog room to see her. If you go out in the yard with her and turn her loose she just keeps circling you with hackles up. She will be six months old the end of this week. Has had no lead work done...I have done some and she's good with me but freaks around men; also scared of new women approaching her. High energy level. Real disappointment for a future protection dog. Well that's not good, is it ? Do you want to share more with us about where you imported her from, whether you went over to see / select her, what you told her breeder you were looking for in a dog ? Any guarantees given ? Five days ought to be enough for a pup of this age to start to show at least the first signs of settling in, even if she was upset by a very rough journey for some reason. I seen something like this before a few times. 6 months is an awkward age for a dog alot of changes happen at that age in the mind and body. Questions I would as. you how far did the dog travel how long as she in transit. At six months could be close to a season . And I would suggest you don't rush her take your time let her come to your husband not your husband coming to her and every time she does feed her a dog with tin nerve. (she might have) which is not a bad thing it will just take a bit longer to make her stronger in suitations. And work wise if done correctly she will be OK. But take your time 5 days is nothing. Sounds like she's genetically fearful. I've dealt with this before, and the only solution - after a TON of work, I don't give up easily! 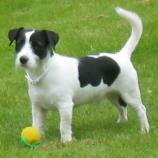 - was to rehome the dog to a pet home, where no demands would be placed on her. I agree with Sunsilver.. dog has genetic softness....trip shouldn't be a problem...I've imported toy dogs from Europe and they were sound upon arrival. My husband does wait for this dog to come to him but she is terrified of people. If you approach her she runs out the doggie door. I don't think a true working dog should react this way. We've had highly titled imports for almost 40 years and I've never seen one this soft in temperament. NOT our first rodeo...puppy came from Eastern Europe. Still trying to work out something with the breeder so dont want to mention name but $3300 for a 6 month old spook is a bit much. She has also destroyed two gates if you leave her in an outside run and starts hollering. She is DDR breeding. As much as "DDR breeding" still exists ... there is a red flag label, just to start with. Suggest you do a Search on DDR topics here on PDB. Wall has been down a VERY long time now. Could you, even if you don't want to post the pedigree yet, at least give some idea for the folks on here of some of the dogs supposedly in her ancestry ? You might have already been 'around the block' a time or two, but unfortunately you could still have been 'taken'. It does sound as though she is 'born spooky', I agree; but dogs are individuals, just because you imported something else long distance and nothing upset it, does not automatically mean nothing bad happened THIS trip. You may never know. But it never pays to close your mind to every possibility. There is a big difference between a scared dog and a week dog. A dog a 6 months with no social skills or environmental stuff done will be very scared. But hay you have been around dog for 40 years so you would know. What I can't understand if this dog is week and you have the knowledge of 40 years it must have shown some week dogs in the pedigree so why would u buy her. Or else the pedigree is very strong which if anyone inported a dog it would be on that strength of strong pedigree the dog needs time and may be the time u are not willing to put in which I'm not saying u are wrong u payed good money u should have got the dog u paid for. Lack of socialization is main culprit,imo. If dog was raised outside in kennel with very limited contact with people outside of pack for SIX months, you often see the behavior you describe.